For the trees informally called mountain-ashes, see Rowan. Eucalyptus amygdalina var. regnans F.Muell. Eucalyptus regnans, known variously as mountain ash, swamp gum, or stringy gum, is a species of Eucalyptus native to Tasmania and the state of Victoria in southeastern Australia. It is the tallest flowering plant and one of the tallest trees in the world, second only to the coast redwood (Sequoia sempervirens) of North America. A straight-trunked tree with smooth grey bark, but with a stocking of rough brown bark from 5 to 20 metres (16 ft 5 in to 65 ft 7 in) above the ground, it regularly grows to 85 metres (280 ft), with the tallest living specimen, the Centurion in Tasmania, standing 100.5 metres (330 feet) tall. White flowers appear in autumn. Victorian botanist Ferdinand von Mueller described the species in 1871. 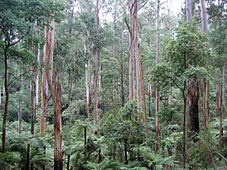 Eucalyptus regnans grows in pure stands in tall wet forest, sometimes with rainforest understorey, in temperate areas receiving over 1,200 millimetres (47 in) of rainfall a year, on deep loam soils. A large number of the trees have been logged, including those higher than trees of any species now living. One specimen over 132 metres (433 ft) high was recorded in Victoria. Although it is often killed by bushfire, Eucalyptus regnans regenerates from seed and has a lifespan of several hundred years. Mature Eucalyptus regnans-dominated forests have been found to store more carbon than any other forest known. Also known in the timber industry as Tasmanian oak, E. regnans is logged for its wood, and grown in plantations in New Zealand and Chile as well as Australia. Victorian botanist Ferdinand von Mueller described Eucalyptus regnans in 1871, using the Latin regnans "ruling" as its species epithet. He noted: "This species or variety, which might be called Eucalyptus regnans, represents the loftiest tree in British Territory." However, until 1882 he considered the tree to be a variety of Eucalyptus amygdalina and called it thus, not using the binomial name Eucalyptus regnans until the Systematic Census of Australian Plants in 1882, and giving it a formal diagnosis in 1888 in Volume 1 of the Key to the System of Victorian Plants, where he describes it as "stupendously tall". Von Mueller did not designate a type specimen, nor did he use the name Eucalyptus regnans on his many collections of "White Mountain Ash" at the Melbourne Herbarium. Victorian botanist Jim Willis selected a lectotype in 1967, one of the more complete collections of a specimen from the Dandenong Ranges, that von Mueller had noted was one "of the tall trees measured by Mr D. Boyle in March 1867." Genetic testing across its range of chloroplast DNA by Paul Nevill and colleagues yielded 41 haplotypes, divided broadly into Victorian and Tasmanian groups, but also showing distinct profiles for some areas such as East Gippsland, and north-eastern and south-eastern Tasmania, suggesting the species had persisted in these areas during the Last Glacial Maximum and recolonised others. There was some sharing of haplotype between populations of the Otway Ranges and north-western Tasmania, suggesting this was the most likely area for gene flow between the mainland and Tasmania in the past. Eucalyptus regnans is widely known as the mountain ash, due to the resemblance of its wood to that of the northern hemisphere ash (Fraxinus). Swamp gum is a name given to it in Tasmania, as well as stringy gum in northern Tasmania. Other common names include white mountain ash, giant ash, stringy gum, swamp gum and Tasmanian oak. Von Mueller called it the "Giant gum-tree" and "Spurious blackbutt" in his 1888 Key to the System of Victorian Plants. The timber has been known as "Tasmanian oak", because early settlers likened the strength of its wood that of English oak (Quercus robur). The brown barrel (Eucalyptus fastigata) is a close relative, the two sharing the rare trait of paired inflorescences arising from axillary buds. Botanist Ian Brooker classified the two in the series Regnantes. The latter species differs in having brown fibrous bark all the way up its trunk, and was long classified as a subspecies of E. regnans. The series lies in the section Eucalyptus of the subgenus Eucalyptus within the genus Eucalyptus. Hybridisation with messmate (Eucalyptus obliqua) is not uncommon and has been recorded from several sites in Victoria and Tasmania. Hybrids with red stringybark (Eucalyptus macrorhyncha) occur in the Cathedral Range in Victoria. These trees resemble E. regnans in appearance though lack the paired inflorescences. They have the oil composition of E. macrorhyncha. An evergreen tree, Eucalyptus regnans is the tallest of the eucalypts, growing to 70–114.4 m (230–375 ft), with a straight, grey trunk, smooth-barked except for the rough basal 5–20 metres (16–66 ft). Mature trees have long strips of bark hanging from the trunk. The trunk typically reaches a diameter of 2.5 metres (8 ft) at breast height (dbh), and eventually develops a large buttress. Some individuals attain much greater diameter; the largest known being "The Bulga Stump", a charred remnant near Tarra Bulga, South Gippsland district, Victoria, Australia which as a living tree had a DBH (diameter at breast height) of 10.77 metres (35 ft 4 in), making E. regnans the third thickest species of tree after the Baobab (Adansonia digitata) and the Montezuma Cypress (Taxodium mucronatum). 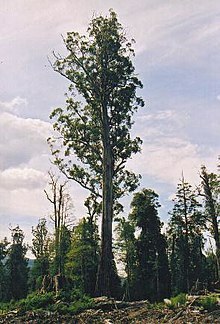 As a consequence of being both the tallest and thickest Australian trees, E. regnans is also the most massive; that title being currently held by an individual called the "Kermandie Queen" discovered 3.9 kilometres (2.4 mi) west of Geeveston, Tasmania which measures 76.99 metres (252 ft 7 in) in height and has a diameter at breast height (DBH) of 6.88 metres (22 ft 7 in) girth. The crown is open and small in relation to the size of the rest of the tree. Arranged alternately along the stems, the adult leaves are falcate (sickle-shaped) to lanceolate, 9–14 centimetres (3.5–5.5 in) long and 1.5–2.5 centimetres (0.6–1.0 in) broad, with a long acuminate apex and smooth margin, green to grey-green with a reddish petiole. The upper and lower surfaces of the leaves are the same colour, and are dotted with numerous circular or irregularly-shaped tiny oil glands. Secondary leaf veins arise at an acute angle from the midvein and tertiary venation is sparse. The flowers are produced in clusters of 9–15 together, each flower about 1 centimetre (0.4 in) diameter with a ring of numerous white stamens. These appear between January and May. On 4–7 millimetres (0.16–0.28 in) long pedicels, the fruit is a capsule 5–9 millimetres (0.20–0.35 in) long and 4–7 millimetres (0.16–0.28 in) broad. Roughly cone-shaped, it has a disc at the base. The disc usually has three valves, which open to release the 1.5–3 millimetres (0.059–0.118 in) brown seed. The hilum is at one end of the pyramid-shaped seed. Seedlings have kidney shaped cotyledons, and the first 2–3 pairs of leaves are oppositely arranged along the stem, before switching to an alternate arrangement. These juvenile leaves are 5–13 centimetres (2.0–5.1 in) long and 2.5–4.5 centimetres (1.0–1.8 in) broad and ovate in shape. Eucalyptus regnans is the tallest of all flowering plants, and possibly the tallest of all plants, although no living specimens can make that claim. The tallest measured living specimen, named Centurion, stands 100.5 metres (330 feet) tall in Tasmania. Before the discovery of Centurion, the tallest known specimen was Icarus Dream, which was rediscovered in Tasmania in January, 2005 and is 97 metres (318 ft) high. It was first measured by surveyors at 98.8 metres (324 ft) in 1962 but the documentation had been lost. A total of 16 living trees in Tasmania have been reliably measured in excess of 90 metres (300 ft). The Cumberland Scenic Reserve near Cambarville, became the site of Victoria's tallest trees, in 1939, including one measured at 92 metres (302 ft) high, following the extensive Black Friday bushfires. A severe storm in 1959 blew down 13 of the trees and the tallest tree was reduced to a height of 84 metres (276 ft) after it lost part of its crown. The height of this tree was cited as 81.5 metres (267 ft) in 2002 following further storm damage in 1973. In 2000, a tree at Wallaby Catchment in Kinglake National Park was discovered to be 91.6 metres (301 ft) tall in 2000, however it perished in the Black Saturday bushfires of 2009. Historically, the tallest individual is claimed to be the Ferguson Tree, at 132.6 metres (435 ft), found in the Watts River region of Victoria in 1871 or 1872. This record is often disputed as unreliable, despite first-hand documentary evidence of it being measured on the ground with surveyor's tape by a senior forestry official (see below). Widespread agreement exists, however, that an exceptionally tall individual was reliably measured at 112.8 metres (370 ft) by theodolite in 1880 by a surveyor, George Cornthwaite, at Thorpdale, Victoria (the tree is known both as the Cornthwaite or Thorpdale Tree). When it was felled in 1881, Cornthwaite remeasured it on the ground by chain at 114.3 metres (375 ft). The stump is commemorated with a plaque. That tree was about 1 metre (3.3 ft) shorter than Hyperion, the world's current tallest living tree, a coast redwood measuring 115.5 metres (379.1 ft). Al Carder, notes that in 1888 a cash reward of 100 pounds was offered there for the discovery of any tree measuring more than 122 metres (400 ft). The fact that such a considerable reward was never claimed is taken as evidence that such large trees did not exist. Carder's historical research, however, revealed that the reward was offered under conditions that made it highly unlikely to be collected. First, it was made in the depths of winter and applied only for a very short time. Next, the tree had to be measured by an accredited surveyor. Since loggers had already taken the largest trees from the most accessible Victorian forests, finding very tall trees then would have demanded an arduous trek into remote wilderness and at considerable altitude. In turn, that meant that searchers also needed the services of experienced bushmen to be able to guide them and conduct an effective search. Only one expedition actually penetrated one of the strongholds of E. regnans at Mount Baw Baw but its search was rendered ineffectual by cold and snow and managed to measure only a single living tree – the New Turkey Tree: 99.4 metres (326 ft) – before appalling conditions forced a retreat, Carder notes. Ferdinand von Mueller, claimed to have personally measured one tree near the headwaters of the Yarra River at 122 metres (400 ft). Nurseryman David Boyle, claimed in 1862 to have measured a fallen tree in a deep gully in the Dandenongs at 119.5 metres (392 ft), and with a diameter at its broken tip that indicated it might have lost another eight metres (26 ft) of trunk when it broke, for 128 metres (420 ft). Von Mueller's early records also mention two trees on the nearby Black Spur Range, one alive and measuring 128 metres (420 ft) and another fallen tree said to measure 146 metres (479 ft), but these were either based on hearsay or uncertain reliability. David Boyle also reported that a tree at Cape Otway measured 170 metres (560 ft), but this too was based on hearsay. None, however, had been verified by direct documentation until 1982 when Ken Simpendorfer, a Special Projects Officer for the Forests Commission Victoria, directed a search of official Victorian archives. It unearthed a forgotten report from more than a century earlier, one that had not been referred to in other accounts of the species up to that time. It was written on 21 February 1872, by the Inspector of State Forests, William Ferguson, and was addressed to the Assistant Commissioner of Lands and Surveys, Clement Hodgkinson. Ferguson had been instructed to explore and inspect the watershed of the Watts River and reported trees in great number and exceptional size in areas where loggers had not yet reached. He wrote: "In one instance I measured with a tape line one huge specimen that lay prostrate across a tributary of the Watts, and found it to be 435 ft [133 m] from its root to the top of its trunk. At 5 feet [1.5 m] from the ground it measures 18 feet [5.5 m] in diameter, and at the extreme end where it has broken in its fall, it is 3 feet [0.91 m] in diameter. This tree has been much burnt by fire, and I fully believe that before it fell it must have been more than 500 ft [150 m] high. As it now lies, it forms a complete bridge across a deep ravine." It is also possible that individual trees will again attain such heights. Author Bob Beale has recorded that the tallest trees in the Black Spur Range now measure about 85 metres (279 ft) but – due to major bushfires in the 1920s and 30s – are less than 80 years old and have been growing consistently at the rate of about 1 metre (3.3 ft) a year. A Eucalyptus regnans stand in the Orokonui Ecosanctuary near Dunedin, New Zealand, where E. regnans is an introduced species, contains that country's tallest measured tree, standing 80.5 metres (264 ft) high in 2012. A Eucalyptus regnans in the urban area of Greytown was measured at 32.8 metres (108 ft) in 2011. Eucalyptus regnans occurs in cool, mostly mountainous areas to 1,000 metres (3,300 ft) altitude with high rainfall of over 1,200 millimetres (47 in) per year. In Victoria, stands of tall trees are found in the Otway, Dandenong, Yarra and Strzelecki ranges as well as Mount Disappointment and East Gippsland., However, the distribution is much reduced. Most of the E. regnans forest across Gippsland was cleared for farmland between 1860 and 1880, and in the Otway Ranges between 1880 and 1900, while severe bushfires hit in 1851, 1898 and 1939. In Tasmania, E. regnans is found in the Huon and Derwent River valleys in the southeast of the state. In the Otways, the species is found in wet forest in pure stands or growing in association with mountain grey gum ( Eucalyptus cypellocarpa), messmate (E. obliqua) and Victorian blue gum (E. globulus subsp. bicostata). Other trees it grows with include manna gum (Eucalyptus viminalis), shining gum (E. nitens), myrtle beech (Nothofagus cunninghamii) and silver wattle (Acacia dealbata) The mountain ash-dominated forest can be interspersed with rainforest understory, with such species as southern sassafras (Atherosperma moschatum), celery-top pine (Phyllocladus aspleniifolius), leatherwood (Eucryphia lucida) and horizontal (Anodopetalum biglandulosum). The mountain ash is most suited to deep friable clay loam soils, often of volcanic origin; in areas of poorer soils, it can be confined to watercourses and valleys. The species grows very quickly, at more than 1 metre (3 ft 3 in) a year, and can reach 65 metres (213 ft) in 50 years, with an average life-span of 400 years. The fallen logs continue supporting a rich variety of life for centuries more on the forest floor. The majority of the endangered Leadbeater’s possum population lives in mountain ash forests (Eucalyptus regnans, E. delegatensis and E. nitens) in the Central Highlands of Victoria. The possums use hollows in old trees for nesting and shelter and forage for arboreal arthropods under bark. The vegetation structure of these forests enables the possums to travel through them. Both Leadbeaters possums and yellow-bellied gliders feed on the sap from the trunks and branches. Koalas feed on the foliage, though it is not one of their preferred forage species. Yellow-tailed black-cockatoos nest in the hollows of old trees, in contrast to the Tasmanian wedge-tailed eagle (Aquila audax fleayi) that builds its nest of large sticks at the top of the trees. In a small area of rainforest in Yarra Ranges National Park in Victoria, nine epiphyte species were observed growing on Eucalyptus regnans, the most prevalent of these being the liverwort Bazzania adnexa. The spur-legged phasmid (Didymuria violescens) is a leaf-eating insect that can defoliate trees during major infestations such as one experienced at Powelltown in the early 1960s. Leaves and buds are eaten by the larvae and adults of the chrysomelid leaf beetle Chrysophtharta bimaculata. Stressed trees can be damaged by the eucalyptus longhorned borer (Phoracantha semipunctata), which burrows into the trunk, which exudes a red stain. Eucalypt weevils of the genus Gonipterus commonly damage E. regnans, while the tortoise beetle (Paropsis atomaria) is a common pest of plantations. A study carried out by environmental scientist Professor Brendan Mackey of the Australian National University in 2009 identified that mountain ash forests in Victoria’s Central Highlands are the best in the world at locking up carbon. Mackey and colleagues found the highest amount of carbon was contained in a forest located in the O'Shannassy River catchment, which held 1,867 tonnes per hectare (743.62 long ton/acre; 832.85 short ton/acre) of carbon. This area was a stand of unlogged mountain ash over 100 years old, which had had minimal human disturbance. They further calculated that a E. regnans-dominated forest with trees up to 250 years old and a well-established mid-storey and upper storey could store up to 2,844 tonnes per hectare (1,132.75 long ton/acre; 1,268.68 short ton/acre) of carbon. Eucalyptus regnans lacks a lignotuber and hence cannot recover by reshooting after intense fire. Instead, it can only regenerate by seed, and is thus termed an obligate seeder. The seeds are released from their woody capsules (gumnuts) by heat, and for successful germination the seedlings require a high level of light, much more than reaches the forest floor when there is a mature tree canopy. An intense fire can kill all the trees in a forest, prompting a massive release of seed, which takes advantage of the nutrients in the ash bed. Seedling densities of up to 2,500,000 per hectare (1,000,000/acre) have been recorded after a major fire. Competition and natural thinning eventually reduces the mature tree density to about 30 to 40 per hectare (12 to 16/acre). Because it takes roughly 20 years for seedlings to reach sexual maturity, repeated fires in the same area can cause local extinctions. Trees never subject to a severe fire may have a lifespan exceeding 500 years. Cool temperate rainforest species that live in association with Eucalyptus regnans may gradually replace it in gullies or other areas where the trees succumb to age rather than fire. Eucalyptus regnans is valued for its timber, and has been harvested in very large quantities. Aside from being logged in its natural range, it is grown in plantations in New Zealand and Chile, and to a limited extent, in South Africa and Zimbabwe. Primary uses are sawlogging and woodchipping. It was a major source of newsprint in the 20th century. Much of the present woodchip harvest is exported to Japan. While the area of natural stands with large old trees is rapidly decreasing, substantial areas of regrowth exist and it is increasingly grown in plantations, the long, straight, fast growing trunks being much more commercially valuable than the old growth timber. It is a medium weight timber (about 680 kg/m3 or 1,150 lb/cu yd) and rather coarse (stringy) in texture. Gum veins are common. The wood is easy to work and the grain is straight with long, clear sections without knots. The wood works reasonably well for steam-bending. Primary uses for sawn wood are furniture, flooring (where its very pale blonde colour is highly prized), panelling, veneer, plywood, window frames, and general construction. The wood has sometimes been used for wood wool and cooperage. However, the wood needs steam reconditioning for high value applications, due to a tendency to collapse on drying. This wood is highly regarded by builders, furniture makers and architects. Opposition to logging of wet forests by clearfelling has grown very strong in recent years (particularly opposition to woodchipping). It is a controversial debate with strong opinions both for and against timber harvesting. Several applications have been made to Victoria's Flora and Fauna Guarantee (FFG) Scientific Advisory Committee to list mountain ash forests as an endangered vegetation community. The committee rejected an application in 2017 as being ineligible and that it did not satisfy at least one of the criterion set out in the Flora and Fauna Guarantee Act 1988 and its Regulations of 2011. The assessment criteria included, was there a demonstrated state of decline, has there been a reduction in distribution or has vegetation community altered markedly. Studies conducted by Murray Cunningham and David Ashton found that the re-growth habit of Eucalyptus regnans requires high light conditions, and the high nutrients contained in the ash layer. These conditions are found typically following a high intensity wildfire, which are an infrequent, yet periodic feature of mountain ash forests. For this reason clearfelling – with the complete removal of all trees, followed by a high intensity fire and seeding are used by the timber industry and forest scientists to ensure regeneration of harvested areas because it mimics the conditions found after high intensity wildfire. Melbourne's forested water catchment areas, which provides water requiring little treatment, are composed of large areas E. regnans forest. The management of 157,000 hectares of Melbourne’s forested water catchments were vested in the Melbourne and Metropolitan Board of Works (MMBW) in 1891 with a closed catchment policy where timber harvesting and public access was not permitted. These areas are now included in the Yarra Ranges National Park. There has been a long running political campaign to add more areas to create the Great Forest National Park. Water yields from catchments fall significantly for 20 to 40 years if trees are killed by bushfire or timber harvesting. The MMBW began research into forest cover on water supplies as early as 1948. In the early 1960s they set up a new series of paired catchment experiments in wet mountain forests near Healesville to measure the long term impacts of timber harvesting and bushfire on water quality and quantity. It took another 10 years for the results to emerge more clearly. It was found that while timber harvesting had an impact, the most dramatic threat to stream flows remained catastrophic bushfires like those on Black Friday in 1939 or Black Saturday in 2009. The Styx River in Tasmania runs through a forest of Eucalyptus regnans, myrtle beech and tree ferns. The mountain ash rise high above the forest. "The Big Tree" (previously thought to be the tallest remaining), is about 15 metres (49 ft) around the base. The sign at its base states its dimensions and the tonnage of timber that could potentially be cut from it. A few such trees of extreme size have been recorded by Forestry Tasmania as worthy of preservation. The stump of one of the largest Eucalyptus regnans to be logged in Tasmania. The man is 1.86 m (6 ft 1 in). A very tall mountain ash by a logging road. Trees that have been identified as above the permissible height for logging are left isolated when the forest around them is logged. If reduced in height by storm, the tree becomes loggable. Clearfelled old-growth forest of Eucalyptus regnans near the Styx Valley in southern Tasmania, prior to bull-dozing and burning. Mountain ash logs. Older trees are often hollow and are only suitable for woodchip. Eucalyptus regnans is too large for the majority of gardens, but may be suitable for parks. Propagation is from seed, with the best germination rates being obtained by refrigerating for three weeks before sowing. Seed may be stored for several years if refrigerated and kept dry. Seedlings are grown in containers but are more prone to damping off than other eucalypts; they are highly susceptible to Phytophthora cinnamomi and P. nicotianae Young plants are generally planted out once they are 8 or 9 months old. These are at risk of being eaten by grazing rabbits, wallabies and possums, which can destroy young plantations in severe cases. American horticulturist and entrepreneur Ellwood Cooper noted its rapid growth but demanding soil requirements in his 1876 work Forest Culture and Eucalyptus Trees. Eucalyptus regnans requires fertile soil with good drainage and annual rainfall of 1,000 millimetres (39 in) spread over the year, and has poor tolerance to temperatures below −7 °C (19 °F) or drought. Outside Australia, plantations have been successfully established in New Zealand, South Africa, Kenya and Tanzania. ^ a b "Eucalyptus regnans F.Muell". Australian Plant Name Index (APNI), IBIS database. Centre for Plant Biodiversity Research, Australian Government. ^ a b c d e f g h i Boland, Douglas J.; Brooker, M. I. H.; Chippendale, G. M.; McDonald, Maurice William (2006). Forest trees of Australia. Collingwood, Victoria: CSIRO Publishing. p. 562. ISBN 0-643-06969-0. ^ a b Willis, James H. (Jim) (1967). "Typification of eight Victorian species names in Eucalyptus". Muelleria. 1 (3): 165–68. ^ von Mueller, Ferdinand (1882). Systematic Census of Australian Plants, with Chronologic, Literary and Geographic Annotations. Melbourne, Victoria: Printed for the Victorian government by M'Carron, Bird & Co. p. 57. ^ a b von Mueller, Ferdinand (1888). Key to the system of Victorian plants. 1. Melbourne, Victoria: Robert S. Bain, government printer. p. 236. ^ Nevill, Paul G.; Bossinger, Gerd; Ades, Peter K. (2010). "Phylogeography of the world's tallest angiosperm, Eucalyptus regnans: evidence for multiple isolated Quaternary refugia". Journal of Biogeography. 37 (1): 179–92. doi:10.1111/j.1365-2699.2009.02193.x. ^ a b Tasmanian Timber Promotion Board. "Tasmanian Oak: Eucalyptus delegatensis, E. obliqua & E. regnans" (PDF). Tasmanian Timber. State government of Tasmania. Retrieved 16 February 2015. ^ a b c Ashton, David Hungerford (1953). "The ecology of Eucalyptus regnans F. Muell. : the species and its frost resistance". Australian Journal of Botany. 6 (2): 154–76. doi:10.1071/BT9580154. ^ a b c d e f Slee, A.V. ; Brooker, M.I.H. ; Duffy, S.M. ; West, J.G. (2006). "Factsheet - Eucalyptus regnans". EUCLID: Eucalyptus of southern Australia (Third Edition). Centre for Plant Biodiversity Research. Retrieved 17 February 2015. ^ Ashton, David Hungerford; Sandiford, E.M. (1988). "Natural Hybridisation Between Eucalyptus regnans F. Muell. and E. macrorhyncha F. Muell. in the Cathedral Range, Victoria". Australian Journal of Botany. 36 (1): 1. doi:10.1071/BT9880001. ISSN 0067-1924. ^ a b c Costermans, Leon (1981). Native Trees and Shrubs of South-eastern Australia. Kent Town, South Australia: Rigby. p. 338. ISBN 978-0-7270-1403-0. ^ a b c "Mountain Ash - Eucalyptus regnans". Forest Secrets. Museum Victoria. Retrieved 20 February 2015. ^ Brooker, Ian; Nicolle, Dean (2013). Atlas of Leaf Venation and Oil Gland Patterns in the Eucalypts. Collingwood, VIctoria: Csiro Publishing. p. 195. ISBN 9780643109865. ^ Nicolle, Dean (2006). Eucalypts of Victoria and Tasmania. Melbourne, Victoria: Bloomings Books. pp. 244–45. ISBN 978-1-876473-60-0. ^ McIntosh, Derek. "Mountain Ash "Centurion" - tallest tree in Australia". National Register of Big Trees. Retrieved 19 March 2017. ^ "Welcome to the Centurian!". Forestry Tasmania. 10 October 2008. Archived from the original on 22 February 2014. ^ "New Tallest Tree for Tasmania". Tasmanian Giant Trees Consultative Committee. Archived from the original on 2009-01-25. ^ "Giant Trees Register" (PDF). Forestry Tasmania. Archived from the original (PDF) on 2009-09-13. Retrieved 2009-12-10. ^ a b c d Mifsud, Brett M. (2002). "Victoria's tallest trees" (PDF). Australian Forestry. 66 (3): 197–205. doi:10.1080/00049158.2003.10674912. ^ Mifsud, Brett (March 2012). "The Effect of the Black Saturday Bushfires" (PDF). The Forester (PDF). 55 (1): 8–11. ISSN 1444-8920. ^ a b c d Carder, A. (1995). Forest giants of the world: past and present. Ontario: Fitzhenry and Whiteside. ISBN 978-1-55041-090-7. ^ Martin, G (29 September 2006). "World's tallest tree, a redwood, confirmed". SFGate. Retrieved 15 February 2016. ^ "Boyle, David (1821 - 1900)". Australian Plant Collectors and Illustrators 1780s-1980s. Australian National Herbarium. Retrieved 17 February 2015. ^ Beale, B. (2007). If Trees Could Speak. Stories of Australia's Greatest Trees. Sydney: Allen & Unwin. ISBN 978-1-74114-276-1. ^ Baillie, Chris (2 March 2012). "New tallest tree titleholder". Otago Daily Times. Retrieved 9 February 2014. ^ "Tree Information". The New Zealand Tree Register. New Zealand Notable Trees Trust. Retrieved 2019-02-05. ^ a b c "Biodiversity Assessment Technical Report". Joint Commonwealth and Victorian Regional Forest Agreement (RFA) Steering Committee. 1997. ISBN 0 642 27432 0. ^ a b Wood, S.W. ; Hua, Q.; Allen, K.J. ; Bowman, D.M.J.S. (2010). "Age and growth of a fire prone Tasmanian temperate old-growth forest stand dominated by Eucalyptus regnans, the world's tallest angiosperm". Forest Ecology and Management. 260 (4): 438–47. doi:10.1016/j.foreco.2010.04.037. ISSN 0378-1127. ^ Groves, R.H.; Ride, W.D.L (1982). Species at risk: research in Australia : proceedings of a Symposium on the Biology of Rare and Endangered Species in Australia. Australian Academy of Science. ISBN 978-0-85847-102-3. ^ "Victoria's koala management strategy" (PDF). Biodiversity and Natural Resources Division, Department of Sustainability and Environment. September 2004. Archived from the original (PDF) on 2015-02-16. Retrieved 16 February 2015. ^ Nelson, J.L. ; Morris, B.J. (1994). "Nesting Requirements of the Yellow-Tailed Black-Cockatoo, Calyptorhynchus funereus, in Eucalyptus regnans Forest, and Implications for Forest Management". Wildlife Research. 21 (3): 267. doi:10.1071/WR9940267. ISSN 1035-3712. ^ "Aquila audax fleayi — Wedge-tailed Eagle (Tasmanian)". Species Profile and Threats Database. Department of the Environment. Retrieved 16 February 2015. ^ Kellar, Claudette; Short, Megan; Milne, Josephine (August 2006). "Epiphytes on Nothofagus Cunninghamii and Eucalyptus Regnans in a Victorian Cool Temperate Rainforest". The Victorian Naturalist. pp. 222–229. ISSN 0042-5184. ^ "Tasmanian eucalyptus leaf beetle" (PDF). Identifying pests in Tasmania’s forests. Forestry Tasmania. March 1999. Retrieved 9 February 2015. ^ a b c d CABI (2013). The CABI Encyclopedia of Forest Trees. Wallingford Oxfordshire: CABI. pp. 188–89. ISBN 9781780642369. ^ Salleh, Anna. "Australian forests lock up most carbon". ABC Science. Retrieved 9 February 2015. ^ Keith, Heather; Mackey, Brendan; Lindenmayer, David B. (2009). "Re-evaluation of forest biomass carbon stocks and lessons from the world's most carbon-dense forests". Proceedings of the National Academy of Sciences of the United States of America. 106 (28): 11635–40. doi:10.1073/pnas.0901970106. PMC 2701447. PMID 19553199. ^ Waters, D. A.; Burrows, G. E.; Harper, J. D. I. (2010). "Eucalyptus regnans (Myrtaceae): A fire-sensitive eucalypt with a resprouter epicormic structure". American Journal of Botany. 97 (4): 545–56. doi:10.3732/ajb.0900158. ISSN 0002-9122. PMID 21622417. ^ Dept of Environment Land Water and Planning (2013). "State of the Forest report" (PDF). ^ DELWP (2017). "Flora and Fauna Guarantee Scientific Advisory Committee" (PDF). ^ "Management Of Native Forests". Technology in Australia 1788-1988. Australian Academy of Technological Sciences and Engineering. Australian Science and Technology Heritage Centre. 2000. Retrieved 9 February 2015. ^ "Eucalyptus Study Tour". Food and Agriculture Organization of the United Nations. Retrieved 17 February 2015. ^ "Great Forest National Park". ^ Wrigley, John W.; Fagg Murray (1979). Australian Native Plants. William Collins Publishers Sydney, Australia. p. 330. ISBN 0-00-216416-7. ^ "Eucalyptus regnans". Australian Native Plants Society (Australia). Retrieved 9 February 2015. ^ Cooper, Ellwood (1876). Forest Culture and Eucalyptus Trees. San Francisco, California: Cubery & Company, printers. p. 31. ^ Borota, J. (2012). Tropical Forests: Some African and Asian Case Studies of Composition and Structure. Elsevier Science. p. 204. ISBN 978-0-444-59958-2. Bootle, Keith R. (2005). Wood in Australia: types, properties and uses (2nd ed.). New York: McGraw-Hill. ISBN 0-07-471312-4. Wikimedia Commons has media related to Eucalyptus regnans. Prof Stephen Sillett's webpage with a photo tour of Eucalyptus regnans canopy taken during canopy research.